Ramya is a housewife and her husband is a vegetable vendor who goes to markets in villages to sell vegetables and earns Rs. 600/- per week. 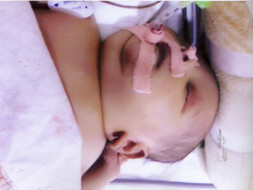 Theeir baby was doing well till 9 days only later he started crying continuously and hence they took him to the doctor. As they were no good hospitals in their native, Ramya took him to Mysore where the doctor suspected the child to have cardiac problem. They also informed the parents that if they had delayed a day more the child wouldn’t have survived. Hence the doctor advised them to take the child to Bangalore before which the child’s health was stabilised and was shifted in the ambulance to Jayadeva hospital were the child underwent stenting procedure to the heart for Aorta with PPHN and Hypokaemia with severe Sepsis. The doctor post-surgery informed that the child has several infections for which they tried to treat the child but was not able to control. Hence the doctors advised them to shift the child to a hospital with NICU facilities and hence the child was brought to MHB for NICU care to stabilise infections after which he underwent another major cardiac surgery. The mother has also been admitted in another hospitals she has been diagnosed with dengue 2 -3 days back. Till date their bill amount is Rs. 4,47,773 and might need further Rs. 2 to 3lakhs depending on the day to day condition of the baby. 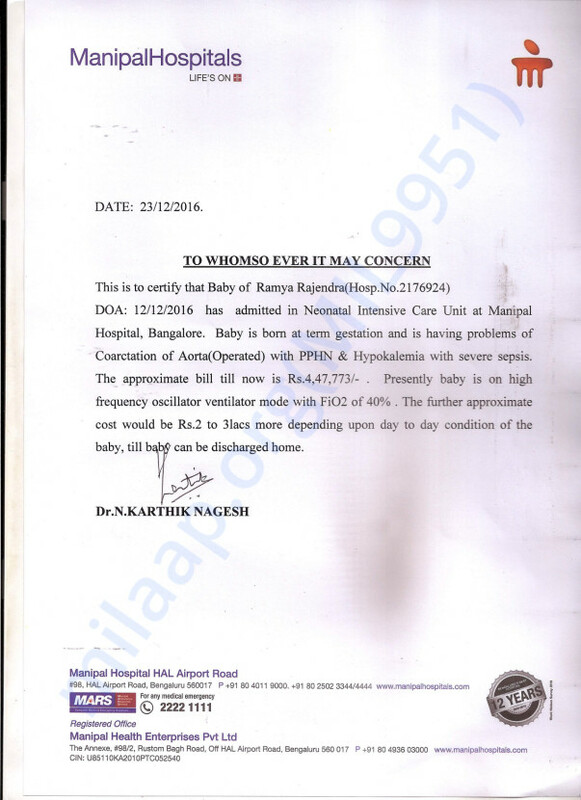 As per the consultant baby’s condition is improving and may require other 2 to 3 weeks of admission. Thank you for supporting the baby unconditionally. The baby suffered several episodes of pulmonary haemorrhage in January, the first one on 13th and the second one on 17th., for which he was given intratracheal adrenaline for 11 days. The bleeding gradually decreased and stopped. He also got diagnosed with pneumonia in between and was given antibiotics for it. Blood transfusions were also given over the time he was in the hospital. The baby was kept on high-frequency ventilation mode from 24.01.17. On 27.01.17, the baby had acute pulmonary bleed and CPR was given, but sadly the baby could not be revived. Ramya is filled with gratitude for the people who came forward to support her son. We once again thank all the donors for your support. May his soul rest in peace. We pray the family finds strength in this time of grief. Thank you for coming forward to help this 2-months-old baby. Since 8th of January, his condition became quite critical. He was on ventilation as his heart was not pumping well. The situation became more complicated since the baby started developing lung problems. This morning, the doctors and patient’s family discussed regarding the baby’s treatment. However the baby fighter could not make it. We deeply regret to inform you that despite the best efforts, the baby passed away on 27th January 2017 around 11am even before the surgery could take place. Ramya is deeply touched by the huge number of donors who came forward to save her baby. Thank you for supporting Ramya’s baby. It’s been a month since the baby was moved to Manipal Hospital, Bangalore and successfully underwent a surgery, wherein a stent was placed in his heart. However, he is still on ventilator as his heart is not pumping well. On the 8th of January, his condition became critical. His stomach was swollen again, how it was, when he was first admitted to the hospital. As informed by the doctor he will have to undergo another surgery after 3 months. Their expenses have been really high over the month as the medicines alone cost around Rs 35000 – Rs 40000 per day. When Ramya was showed the number of people fighting along with her, she had nothing but teary eyes and a heartfelt smile. You all have been a great support. Let’s continue to keep Ramya’s baby in our prayers. May Sri Datta bless you ! I sincerely hope your baby comes through this and becomes healthy and happy.